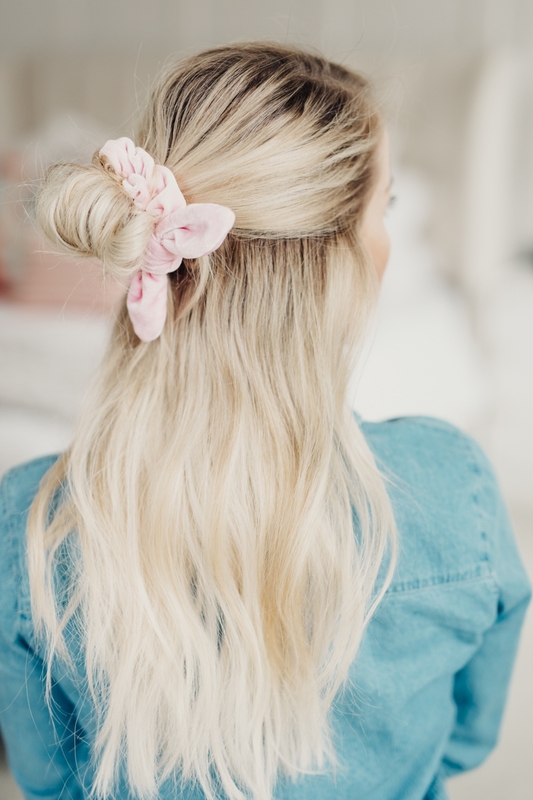 8 Ways to Wear a Scrunchie! Hey everybody!!!! You guys loved the 10 medium length hairstyles video so much that I thought I’d make another little round up of styles for you. Lately I’ve been wearing scrunchies… like a lot. 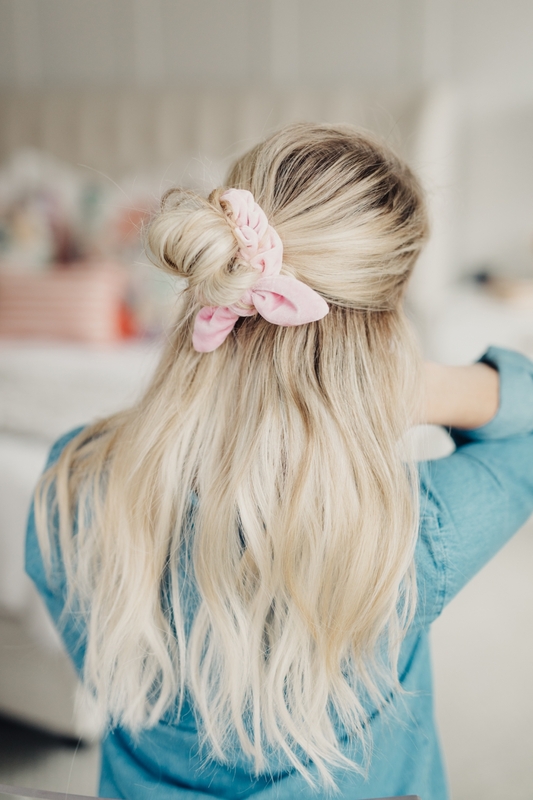 Just give me all the scrunchies! 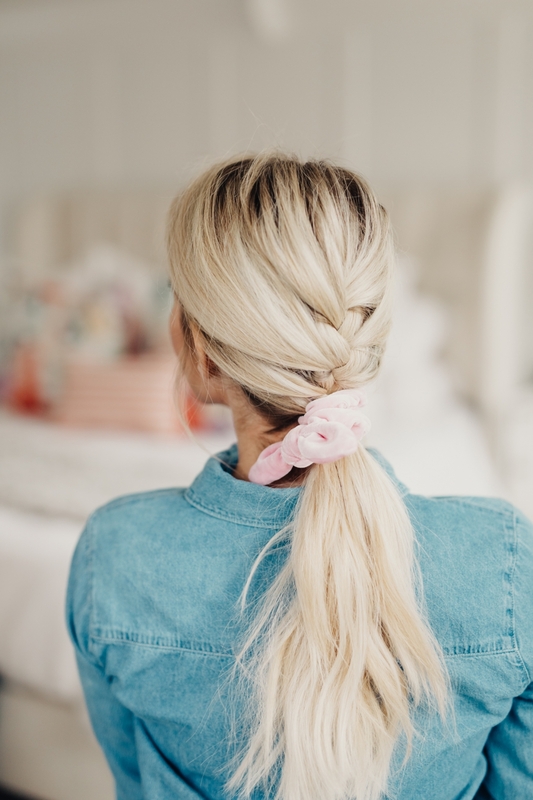 I prefer scrunchies to elastics because they really help me avoid damaging my hair, and they pretty much elevate every single hairstyle I can think of!! 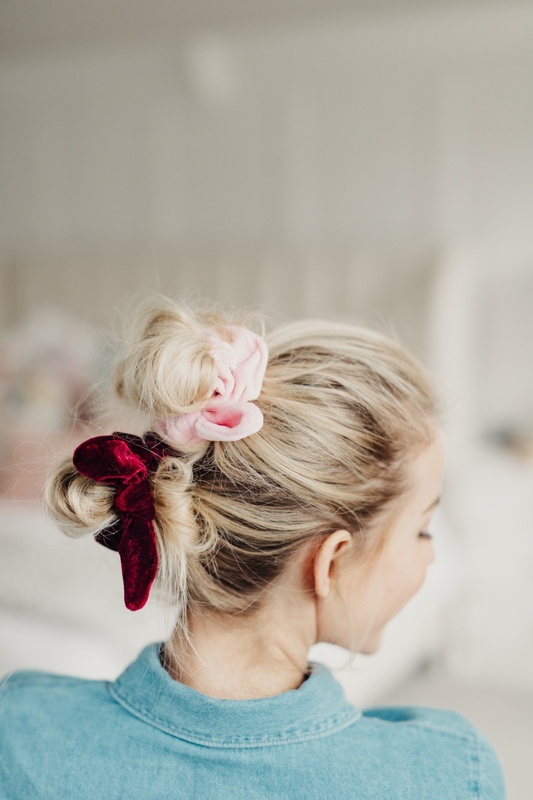 Scrunchies are great to use at night when you want to save your curls for the next day – check out hairstyle #2. 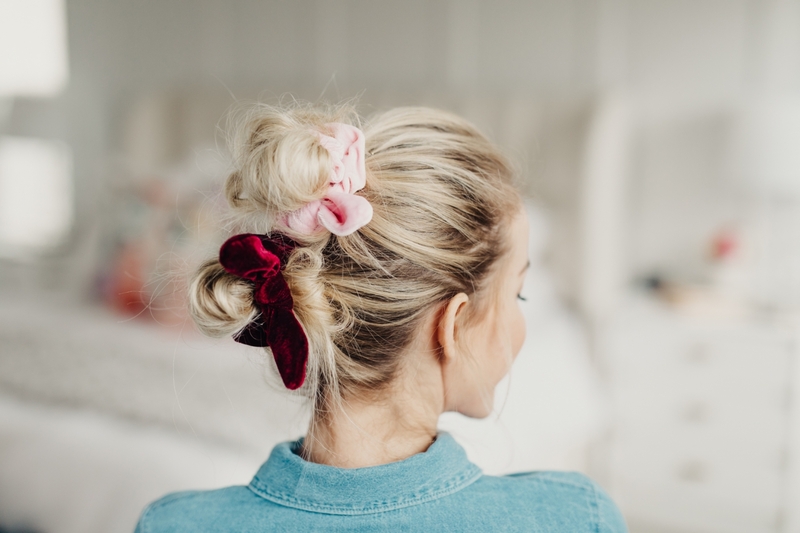 Scrunchies are great if you have really long hair and the weight of it hurts your head when styling a top knot. I don’t know what it is, but I could wear a scrunchie all day and not feel a thing. 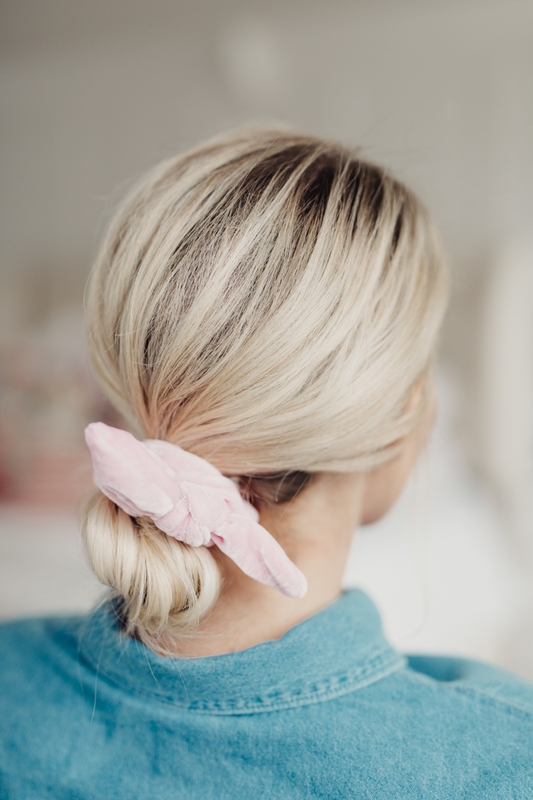 Scrunchies are great when you need to put your hair up wet because they’re so soft and gentle on your vulnerable wet hair. Scrunchies are great when you want to be a cool hipster that does cool things…? Maybe? I don’t know. I feel like I’ve given you enough reasons to love the scrunchies. Now here is some proof in the hairstyles! 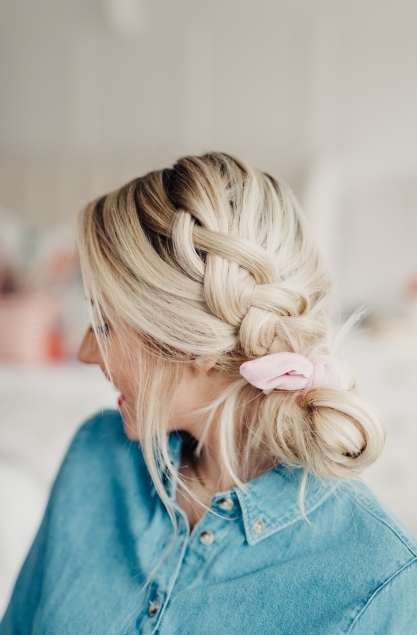 Hairstyle 1: French Braided Ponytail. This one is so easy and so cute!!! I like styling my hair like this when I need it out of my face but still have pretty curls from a earlier in the week. Hairstyle #2: Ballerina Bun. I wear my hair like this when I need to save curls. If you roll the hair in the direction most of your curls are going, it’ll preserve them over night or if you’ve got something fancy to do in the evening but need some quick during the day! 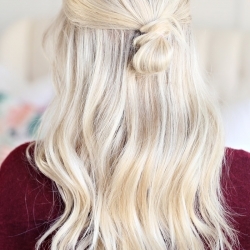 Hairstyle #3: Half-up Top Knot. Probably my favorite hairstyle in the world!!! 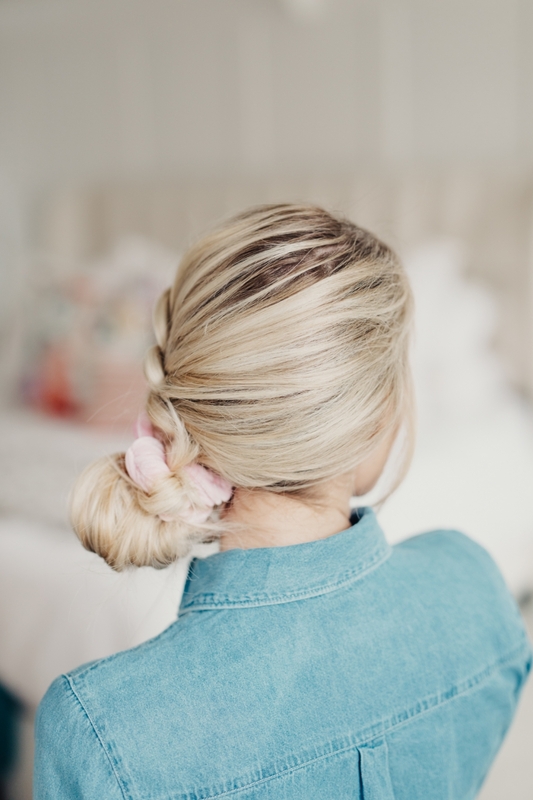 It’s so fun and flirty and wearing my hair like this helps when most of my curls look good except those top layers — which are the ones that need the most TLC. 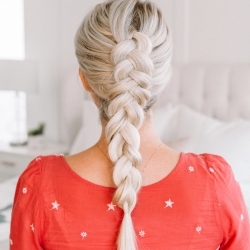 Hairstyle #4 Dutch Side Braid – Of course, you’ve gotta have a big ole’ dutch braid. I styled this one further back on the head so leave some pretty bangs and fringe out, just to give it a more relaxed look. 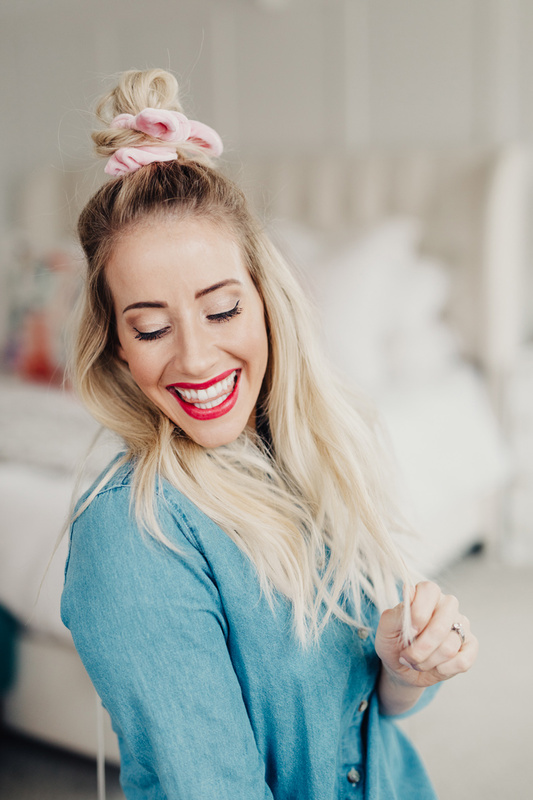 Hairstyle #5: Half Up Bun – This is just another variation on the half up top knot, just pulled further back in case you’re not about that top knot wearing life haha! 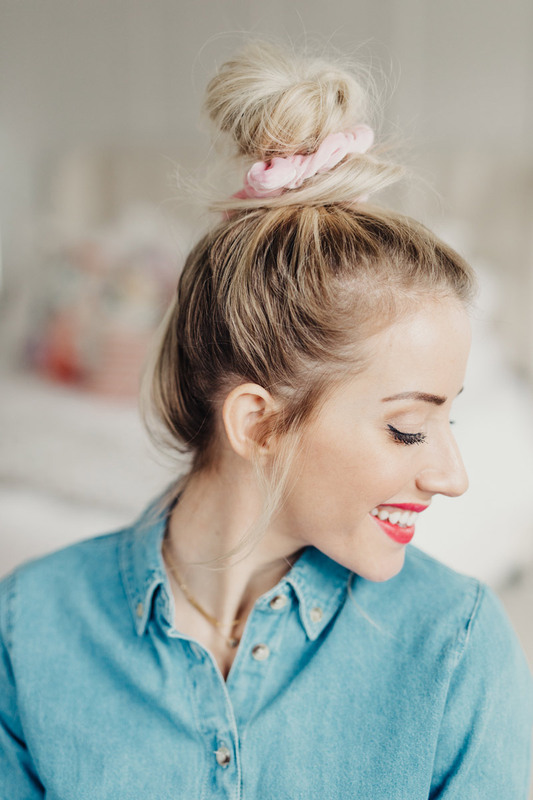 Hairstyle #6: Top Knot – You’ll find me wearing this hairstyle A LOT. With four kids running around, I honestly just don’t have time to style my hair super cute everyday. So on day four, when my curls are a mess and I can’t salvage anything without a lot of work, I’ll throw my hair in a top knot. Once it’s up in a bun though, I’ve gotta rely on long braids and buns the rest of the week cause there ain’t no way I can rescue curls after the top knot haha!!! 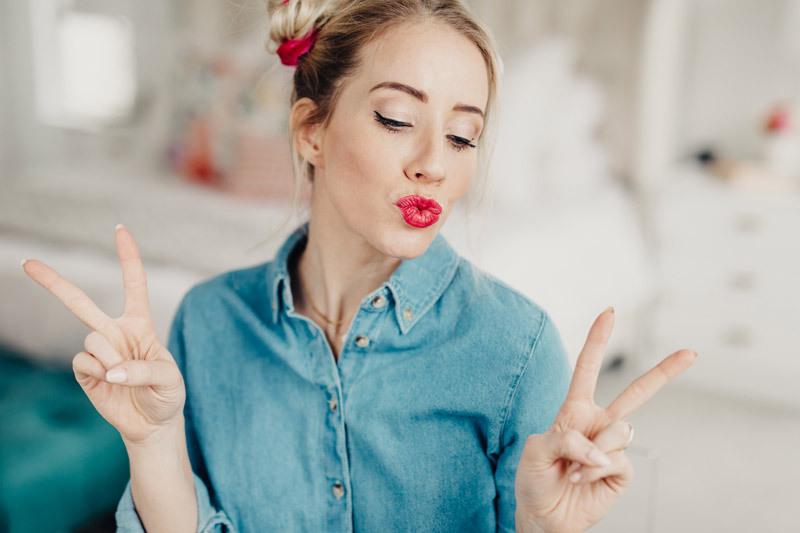 Hairstyle #7: Double Buns! This one is SO CUTE!!!!!! Of course, I couldn’t find my second pack of scrunchies I’d purchased so just pretend they’re both light pink. This style is so fun and perfect for those of you with super long hair that get annoyed by the top knot. 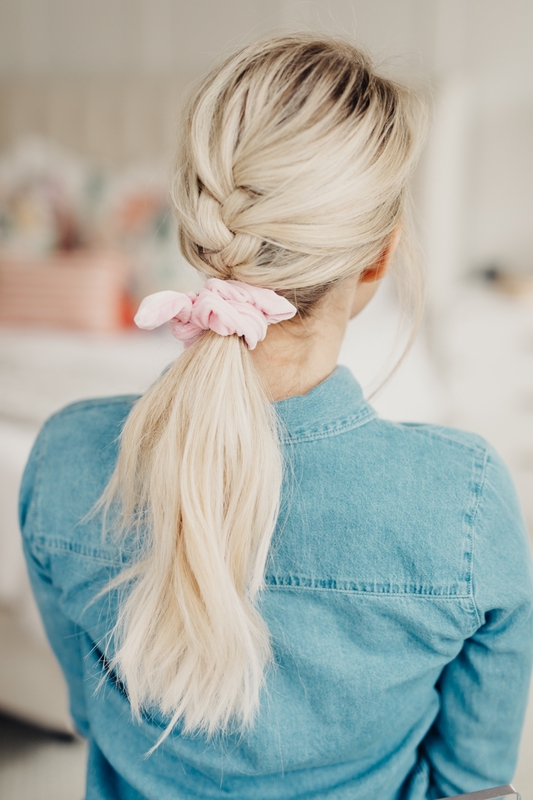 OR it works on those of us with thinner hair because you ca stretch and pull out those buns to make it seem like you’ve got a ton of hair to play with! Plus Star Wars. 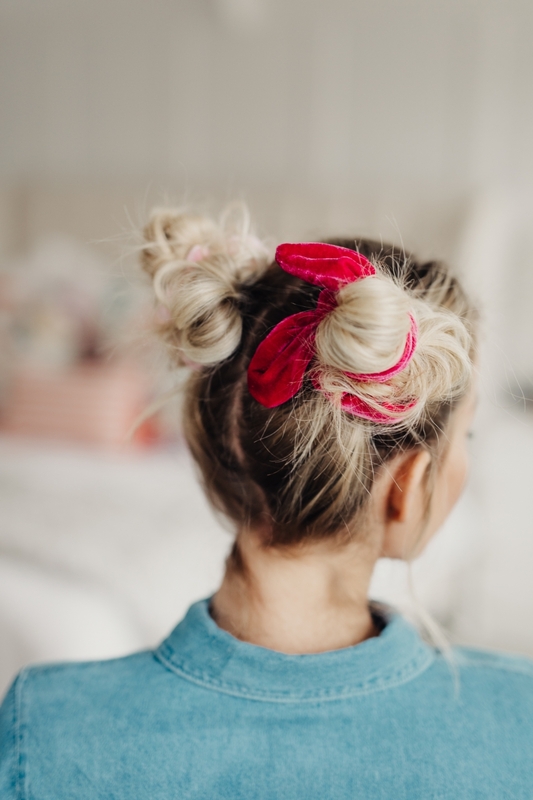 Hairstyle #8: Space Buns – Same thing, pretend both scrunchies are light pink haha!! I don’t wear my hair like this too often because… well I’m 30 ? . But I do wear it at night watching shows or when I’m trying to wash my face. Or when Savy wants to match!! I hope you guys are inspired by this post and make sure to watch the video so you know how to execute each style! And don’t forget to subscribe to my channel – you can subscribe right here! I upload three times a week, Monday and Friday are vlogs and Wednesdays are hair/beauty! How to make UNICORN SLIME!!! 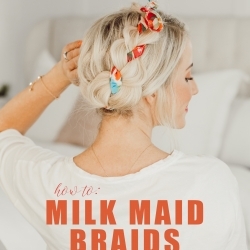 How To: Milk Maid Braids with a Head Scarf!! !